1. 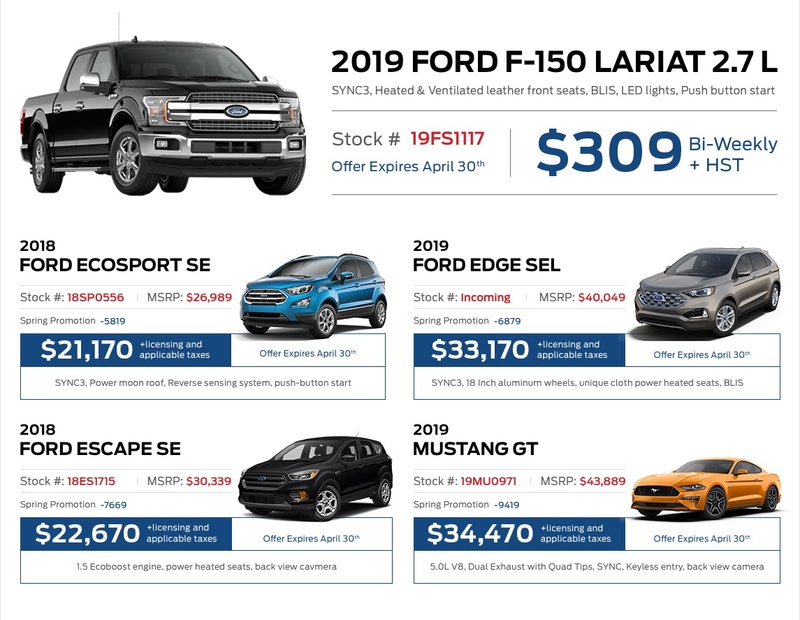 2019 Ford F-150 Lariat: 36 Month Lease at 3.99%, $0 Down, $444.51 Due on Signing, $309 + HST Bi-weekly. Total cost of borrowing is $5049.63. Includes Delivery Allowance. 2. 2018 Ford EcoSport SE: Cash Purchase or Bank Arranged Financing. All rebates such as Delivery Allowance, Technology Bonus, Non-Stackable Cash Purchase Assist applied. 3. 2018 Ford Escape SE: Cash Purchase or Bank Arranged Financing. All rebates such as Delivery Allowance, Technology Bonus, Non-Stackable Cash Purchase Assist applied. 4. 2019 Ford Edge SEL: Cash Purchase or Bank Arranged Financing. All rebates such as Delivery Allowance, Technology Bonus, Non-Stackable Cash Purchase Assist applied. 5. 2019 Ford Mustang GT: Cash Purchase or Bank Arranged Financing. All rebates such as Delivery Allowance, Technology Bonus, Non-Stackable Cash Purchase Assist applied. April specials end April 30th, 2019.